glossary of key terms, and discussion questions. 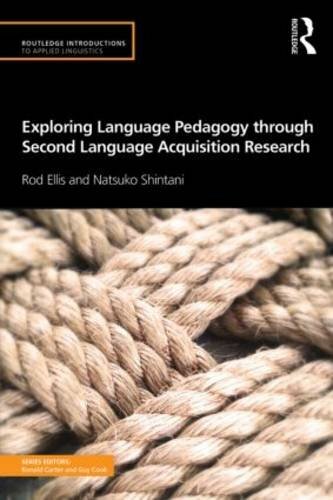 In this book, Ellis and Shintani examine how theory and research relating to second language acquisition can inform language pedagogy. The authors cover the different aspects of language pedagogy that SLA can address, identify problems related to these, and discuss possible solutions to these problems through reference to SLA theory and research. Including a glossary of key terms and questions for discussion at the end of each chapter, and assuming no prior knowledge of Second Language Acquisition, this is the ideal text for all students studying SLA in advanced undergraduate and postgraduate/graduate Applied Linguistics and TESOL courses. Rod Ellis is winner of the BAAL Book Prize in 1985 for the best book published in applied linguistics. Formerly Professor and Head of Department in the School of Language Studies, Ealing College of Higher Education.